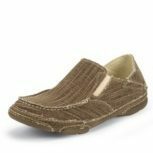 Kick up your feet in the Straw 3R™ Casual men’s slip-on shoe. 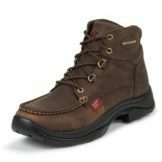 Built for comfort and versatility, this shoe has a burlap-like cloth exterior with a medium round toe and a rubber outsole. The cushioned insole provides a relaxed and comfortable fit for the guy on the go. We can’t wait to show you the personal attention that everyone is raving about so let us make a loyal fan out of you and your family! Come visit us and you’ll see why so many look forward to their next visit to Jones Boots.